When one thinks of the tools of the construction industry, one thinks of well, tools. Girders. Scaffolding. Welding torches. Smartphones. Tablets. What? These digital devices are tools? Yes they are, and increasingly, they are essential to the health of successful construction firms. Meetings and reporting have long been an important part of construction projects, but they are not without their problems. It is often difficult to get everyone together who needs to be present for meetings. Reporting is only as good as the reporter, and reporting can be made more difficult by conditions at sites. Reports can be held up in various offices for a number of reasons. Not everyone who should be seeing those reports always sees them in a timely fashion, either. This could lead to any number of problems, such as supply, scheduling, and a failure to pass on critical information. So what industry wouldn't celebrate the arrival of technology that eliminates the need for frequent sit down meetings by transmitting data to all participants and allows them to participate remotely? A technology that results in improved communications among both employees and clients and helps to avoid costly errors? Or allows employees to work together on a project without having to be in the same room? Or allows their managers and supervisors to complete reports within a few minutes from any location and transmit them to the proper office with the tap of a button? Or that can even prevent costly litigation by getting information ranging from safety issues to work completion schedules quickly? A technology that spells the extinction of those bulky, messy filing cabinets, since those same files can be saved, stored, and protected digitally? Well, the construction industry certainly doesn't object to these innovations, which is why construction software, ranging from Building Information Models, to daily reporting applications is now used at sites on a daily basis. But all these benefits are for naught without the proper company, and one that is frequently turned to in the industry is Raken. Raken provides an app for daily construction reporting that operates on Apple and Android devices. With its software, not only can managers and supervisors complete daily reports much more quickly, they're far more professional looking. 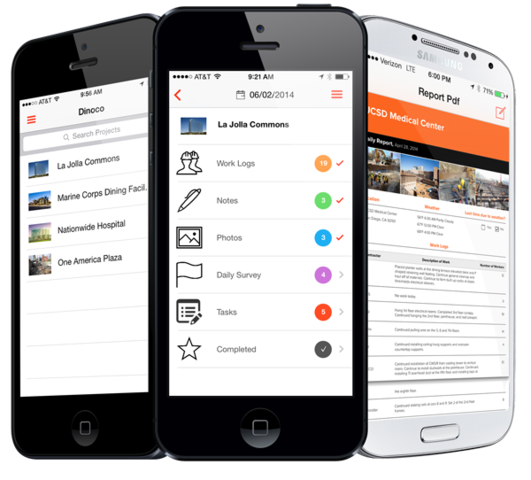 With Raken's construction daily report app, numerous parties, from firm managers to clients, can view and respond to reports much more quickly. Raken allows HD site photographs to be added to reports as well. All of this detailed reporting makes for paperwork that is in compliance with regulations, reducing the chances of litigation. And all this reduction of red tape allows firms to secure new projects more quickly. So while Raken and other new construction software technologies aren’t “old school tools”, construction firms shouldn’t shy away from them. Their use can make a firm safer, more productive, and more profitable.